Earth Hour started in 2007 in Sydney, Australia when 2.2 million homes and businesses turned their lights off for one hour to make their stand against climate change. Only a year later and Earth Hour had become a global sustainability movement with more than 50 million people across 35 countries participating. Global landmarks such as the, Sydney Harbour Bridge, The CN Tower in Toronto, The Golden Gate Bridge in San Francisco, and Rome’s Colosseum, all stood in darkness, as symbols of hope for a cause that grows more urgent by the hour. In March 2009, hundreds of millions of people took part in the third Earth Hour. Over 4000 cities in 88 countries officially switched off to pledge their support for the planet, making Earth Hour 2009 the world’s largest global climate change initiative. Earth Hour 2010 takes place on Saturday 27 March at 8.30pm (local time) and is a global call to action to every individual, every business and every community throughout the world. It is a call to stand up, to take responsibility, to get involved and lead the way towards a sustainable future. Iconic buildings and landmarks from Europe to Asia to the Americas will stand in darkness. People across the world from all walks of life will turn off their lights and join together in celebration and contemplation of the one thing we all have in common – our planet. So sign up now and let’s make 2010 the biggest Earth Hour yet!. It’s Showtime! Show the world what can be done. Earth Hour is organized by WWF. With almost 5 million supporters and a global network in over 100 countries, it’s one of the world's largest and most respected independent conservation organizations. WWF’s mission is to stop the degradation of the Earth's natural environment and build a future where people live in harmony with nature. Turn back the clock on Earth Hour and discover why, how, where and when it all started. Put simply, because our future depends on it! Earth Hour has done a lot to raise awareness of climate change issues. But there’s more to it than switching off lights for one hour once a year. It’s all about giving people a voice on the future of our planet and working together to create a sustainable low carbon future for our planet. New economic modelling indicates the world has just five years to initiate a low carbon industrial revolution before runaway climate change becomes almost inevitable. But it can be done, and the long term benefits will be enormous. So now's the time to take a stand and give world leaders the mandate they need to make the right climate deal. 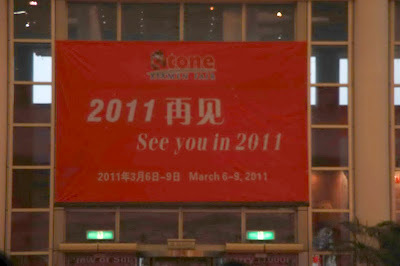 Xiamen Stone Fair , with the rapidly growing speed , aims at No.1 Stone Fair in the world . 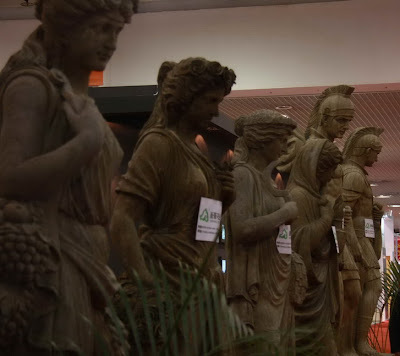 Mar 6-9 , 2010 , the exciting event attracts people from all over the world in stone business , filling up all the classic Xiamen Hotels at the very moment. No. 1 in Asia ? long time ago Xiamen Stone Fair had been No1 in Asia. All the mascots are coming for fun! Time is always not enough ! 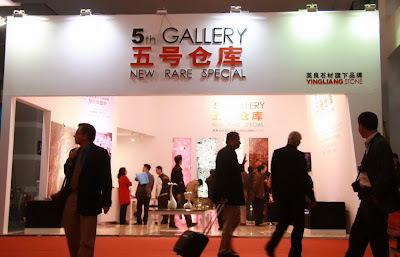 Just got the news from whatsonxiamen.com that Xiamen Stone Fair has ranked the second largest Stone Fair in the world , which in last year Xiamen Stone Fair was No. three in the world . As usual all Xiamen hotels are packed , with those old faces , the world's top class Stone businessmen and businesswomen. 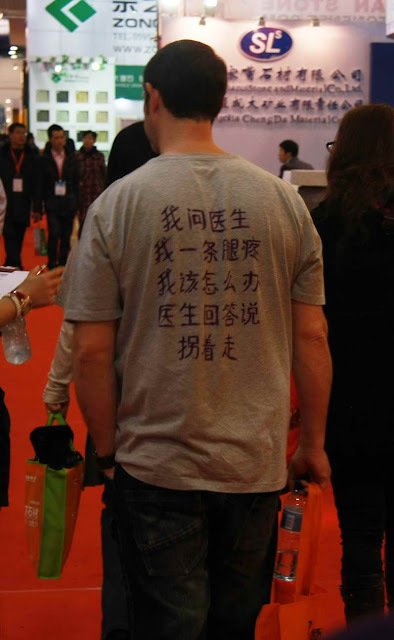 My last year's blog post about Xiamen Stone Fair gives some pictures , quite interesting . This year ? yes , please wait and see. The annual China (Xiamen) International Stone Fair is going to be held on March 6 to 9 this year, which is estimated to attract over 1, 300 exhibitors from over 45 countries. The exposition area will cover an area of 95,000 square metres. More than 1,300 stone enterprises are expected to participate in the stone fair, including 1,000 domestic enterprises and 250 overseas enterprises. “The stone fair will even have larger scale than the CIFIT. There are still 50 more enterprises expressing their wish to attend the fair, but we are sorry for failing to meet their requirements because of the limitation of area at present.” said Xiong Yanliang, director of the Xiamen Trade Development Bureau. The first Xiamen International Stone Fair was held in 2001, after 10 years of development, the fair has become the most influential stone fair in Asia and second largest in the world, following the Italy Verona Stone Fair. “It is no doubt that China (Xiamen) International Stone Fair will become the most influential stone fair in the world in the future. Italy and Spain are our strongest competitors at present, but the stone business in the two countries has been badly affected during the global economic crisis.” said Hu Jingpei, president of Xiamen Wanli Stone Group.